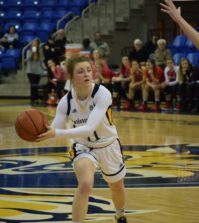 After playing a tough out-of-conference schedule to begin the season 0-5, the women’s basketball team seems to have hit its stride, winning its second consecutive game Saturday afternoon. Quinnipiac beat Wagner 85-72 in both teams’ conference opener at the TD Bank Sports Center. The Bobcats (2-5, 1-0 NEC) scored a season-high 85 points, 53 in the first half, and had four players score in double figures. Sophomore guard Felicia Barron led the way with 14 points and eight assists. Sophomore forward Shelby Sferra, senior forward Alyssa Jann and freshman forward Brittany McQuain added 12, 11 and 10 points respectively. The Bobcats opened up their biggest lead of the game, 50-24, on Alyssa Jann’s three-pointer with 1:53 left in the first half. Wagner (3-3, 0-1 NEC) went on a big run to start the second half and a 53-31 halftime lead was quickly cut to a 63-51 lead with 11:17 remaining. But the Seahawks wouldn’t get any closer. Wagner senior Ashley Olson led all players with 18 points and nine rebounds. The forward also added five assists and two steals. The Bobcats shot 46.6 percent from the field, while holding Wagner to only 37.5 percent shooting. The Bobcats also shot a season high 83.3 percent (25-for-30) from the free throw line. In their previous six games, the Bobcats had only shot 64 percent from the line as a team.